Company A, 3rd Maine is always happy to welcome new members to our organization. 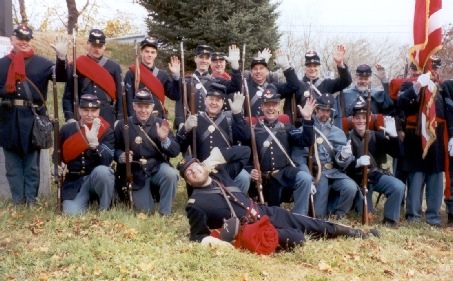 If you are interested in history, especially the American Civil War, and like to have fun, please consider joining us. We are open to individuals and families. Our Constitution and By-Laws explain how we are organized and what is expected of our members. More information about what to expect as a new Recruit Private can be found here, and our guidelines for achieving and maintaining authentic Civil War military and civilian camp impressions can be found here. All new members begin their first year with us as associates. Annual dues for individuals are $25.00 and for families $35.00. Most of these funds are applied to the production and distribution of our monthly newsletter and to cover our insurance policy. Depending upon your personal interests, you may join the Infantry, Fife & Drum, or the Civilian Ladies (for women only, of course! ), or you can participate in more than one aspect of reenacting! Other specialty impressions must be approved by the unit membership. For more information, please contact one of the individuals listed below. You can also print out one of our information flyers (includes a mail-in request for more information) or, if you are ready to join right now, an application for membership.